SquareTrade © AP6.0Information:ID: 6478-BDiamond Weight: 3.50 CaratsStones: 2 Brilliant Round Black Diamonds / Brilliant Round White Diamonds Clarity: SI2Color: H-I Setting: ProngMetal Type: 14KT White Gold Metal Weight: 2.8 GramsWidth: 9.4 mm Length: 19.1 mm Estimated Retail Value: +$4,000.00New Low Price: $2,995.00Description:A pair of diamond studs is an essential indulgence for any lady or gentleman of bearing. Rarely have style and practicality co-existed in such harmony as in our stunning design. Either with casual attire or formal; diamond studs transcend fashion trends, complementing their wearer with elegance and sophistication. 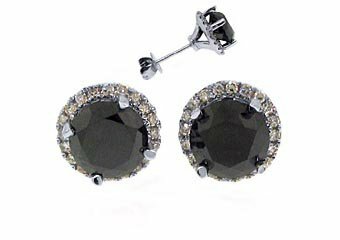 This beautiful pair of stud earrings encompass 2 brilliant round black diamonds and surrounded by brilliant round white diamonds weighing exactly 1.75 Carats each. The stones are set by professional setters in a 4 prong setting. These diamonds are an amazing white H-I color and SI2 clarity. Featuring "clip in backs" for added loss protection! Make a special someone in you're life truly happy! !FREE Re-SizingA Gift BoxAccompanies each purchase& Professional Appraisal Jewelry Masters strives to provide an unparalleled level of gem quality, exquisite design, with the finest craftsmanship, and personalized service at the lowest wholesale prices. Our goal is to become the best service oriented online retailer of quality jewelry by building trusting, and longstanding relationships with our clients. With over 20 years of professional jewelry experience, ranging from wholesale diamond selling to operating a full-service online and retail jewelry store, we assure that every item is of the highest quality, attended to with personal care, and guaranteed to meet your satisfaction. It is our desire to set the standards in online and retail jewelers for honesty, integrity, and competence. Please view our feedback profile and buy with confidence.Return Policy and Warranty Info Click HERE.One of our friendly representatives are here to assist with product questions.E-mail: Press the "Ask a question" link within eCRATER.Telephone: 1 (310) 628-3534Click HERE to see rock bottom prices on diamond jewelry in our eCRATER Store.Click HERE to view our collection of Black Diamond Stud Earrings!JEWELRY MASTERSQuality YOU can trust!Thank you for looking!